Laurel Lake, much larger than Fuller Lake at 25 acres, was created deliberately in 1830 to provide water power to Laurel Forge. This addition to the industrial operation was built by Ironmaster Peter Ege to increase his profits: at his new forge, pig iron from the furnace was transformed into wrought iron bars which sold for much higher prices. The forge included two huge “helve hammers” which smashed onto red hot iron “pigs” about once a second. It would not have been very pleasant to be in or around the forge when the hammers were in use. Try to imagine the harsh sounds of yesteryear while you fish, swim or paddle around the peaceful lake today. The forge operation ended in 1895 or early 1896, not long after the furnace stopped making pig iron. Unfortunately, the remnants of the forge were lost in forest fires in 1900 and 1915. 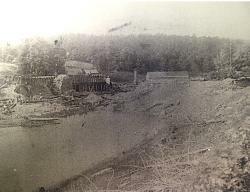 The forge was located at what’s today a gravel parking lot near the bottom of the dam. Workers’ houses once lined Pine Grove Road east from there; they burned in the forest fires, too. After 1895, the old dam that created “Laurel Forge Pond” was maintained for the sake of a commercial ice operation that continued into the 1920s, and for recreation. The original dam was built of timber, stone, and dirt -- it failed in 1847, 1889 (pictured right), and 1919 but was rebuilt each time using the same “timber crib” design. In 1968 the old dam was finally replaced with the solid concrete structure you see today. Peter Ege would be amazed to see the new dam and so many people enjoying his industrial site! For more information, check out “The Dam at Laurel Forge Pond” http://www.pinegrovefriends.org/home/park-materials. Today, with cool water, a sandy beach, and a scenic mountain backdrop, Laurel Lake is a top destination in Cumberland Valley to stay cool on warm summer days.